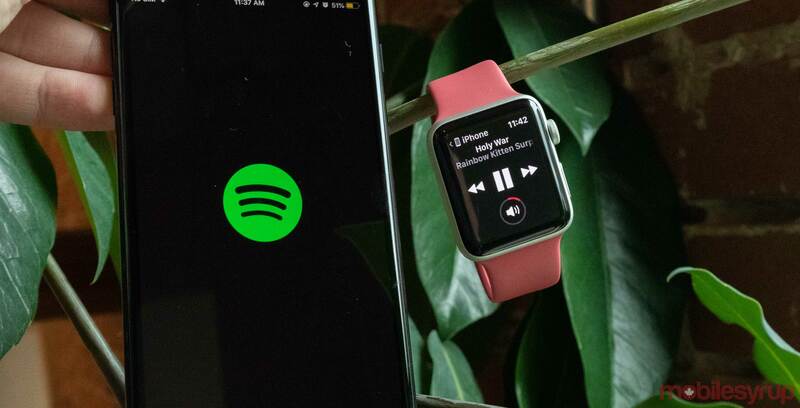 Music streaming giant Spotify quietly released its Apple Watch app to beta testers last week, and now the app’s features have been detailed by The Verge. For a lot of people, the app’s main draw is the ability to use your Apple Watch to control what’s playing on your iPhone or other device using Spotify’s Connect feature. The app does fall a bit flat since it doesn’t let users store playlists or stream music over LTE to their wearable. Both features are available to Apple Music subscribers. The Spotify Apple Watch app uses the company’s signature neon green highlights, but there are a few differences from Spotify’s iPhone app and Apple Music on the watch. Opening the app presents you with a ‘Recently Played’ section, like the bottom half of the ‘Library’ screen on Spotify’s mobile app. Swiping to the left brings you to the currently playing screen which, interestingly enough, uses a heart icon to save songs instead of Spotify’s usual plus and checkmark combo. The Spotify app also replaces Apple’s ‘Now Playing’ screen on the watch. Whenever music is playing on my Apple Watch, without the Spotify watch app installed on it, it appears in a Now Playing app that lets users control the volume along with play/pause and skip functions. The app replaces this screen with Spotify’s currently playing option instead. Which, grants users access to Spotify Connect and allows them to save the current song to their library. There is play/pause, skip forward and back, and the Digital Crown controls the volume. Overall, this seems like a solid first attempt to get Spotify on Apple Watch. Having Connect on your wrist sounds incredibly handy, but here’s hoping Spotify plans to add more features soon to help it compete with Apple Music on watchOS.